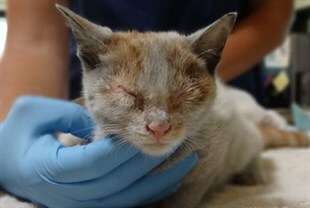 After a two week journey across the Pacific in a shipping container with no food or water, Ni Hao a three month old kitten is recovering in California and looking for a new home. Officials said at first he was too weak to even stand when the container was opened last week after the two week, 10,450km journey from Shanghai. It has not been made clear how the orange and white colored kitten, named Ni Hao or ‘hello’ in Mandarin, got into the container. Marcia Mayeda, head of the Los Angeles Department of Animal Care and Control said after a week of care Ni Hao has greeted the medical team with his first meows and is attempting to stand. A loving home is in need for Ni Hao who in theory has to remain in quarantine for 60 days though may be allowed to finish the quarantine period under the care of a foster family if his health continues to improve.